Hey, gals! I am super excited because today's post is with an adorable local boutique - Tailored! Tailored is the sister store to Obsession Boutique (if you want to see more from them stay tuned for next Friday's post! Tailored is still a newer boutique, and today is actually their birthday! I got to put together some super cute looks to share with you guys so let's get into it! Just a reminder, if I can find the items online I will link them under the pics for you guys who are not local! If you're not local make sure that you go follow them on Instagram HERE and you can shop from there! If you just comment on any pic of the item you want they will send you an invoice and ship it right to you! The first look is this gorgeous maxi, and it's one of my favorites from the shoot. Being a tall girl I don't reach for maxi's much because I feel like they don't fall well on me. However, I couldn't help but try this one out and I am so happy I did. The detail on this dress is gorgeous and would be perfect for a summer date night or as a dress if you will be attending a wedding. There's so many ways to dress this look up or down so you're really getting your moneys worth out of the dress! What I did to keep this look more casual was parired it with a pair of sandals. This took this dress from super dressy to something that I could wear to a casual party this spring or summer! But, you could toss on a pair of heels and be ready to go to a wedding or anything else. Switching gears for a second into a more casual, but super fun look! When I walked into Tailored these pants were one of the first things I was drawn too first because of the color, second because of the material. You can seriously do so much with these pants, but for this post I wanted to keep them more causal. I figured it would be more helpful for you guys becuase these pants are very easy to dress up! These pants are INSANELY comfortable, they seriously feel like you're wearing pajamas! They're so effortless and so versatile! The whole goal I had for all of the outfits in this post was for them to be versatile. I feel that if you're going to spend money on something it needs to be able to be worn more than one way at a time! 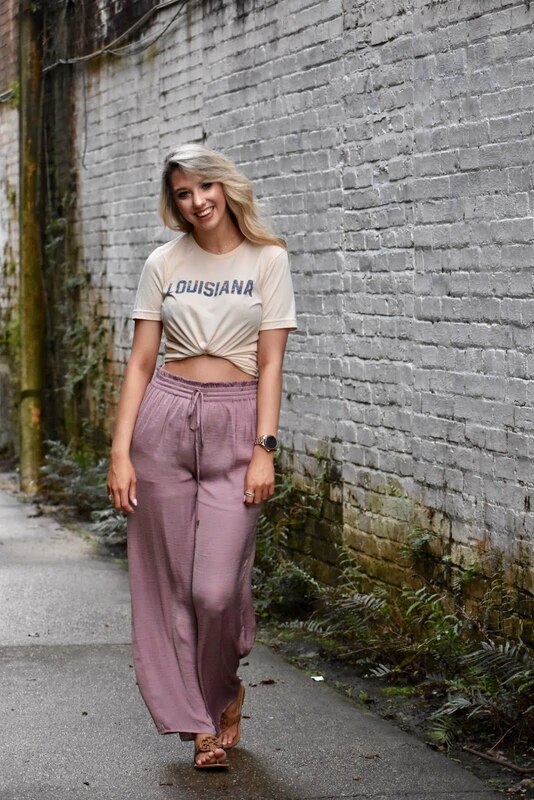 This shirt is super cute for all of my Louisiana gals! I could've simply just tucked this tee into these pants and called it a day, but that just wasn't me. I needed to spice this look up a little bit more than that! For this look I did a simple knot at the bottom front of the tee and then tucked it in to give it this crop top look! I liked the loook of a crop top more than just a regular tee with these pants but loved this tee! So this is how I made it work! Calling all my brides to be, this dress is for you! I completely fell in love when I saw this dress in store and I knew that I had brides to be following me, so this one is for you! This dress is perfect for all of the wedding events that you have coming up before the wedding! 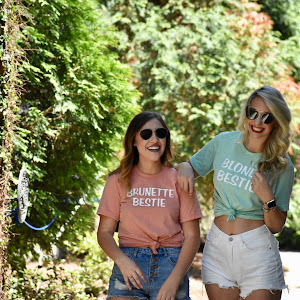 It's totally different than your normal plain white dress and will have you turning heads the whole time! Even if you're not a bride this dress is still stunning! It fits true to size and if you have an event coming up that you need a semi-formal dress for, this dress is for you! I wish I had an event coming up to grab this dress for because it's that gorgeous! It's a reasonable price and amazing quality with a ton of detail! The last outfit from Tailored is a super cute trendy one, it's rare that I do trendy pieces on my page, but I couldn't help it with these flare jeans! While we're talking about flare jeans let's talk about the amazing selection of denim that Tailored offers. 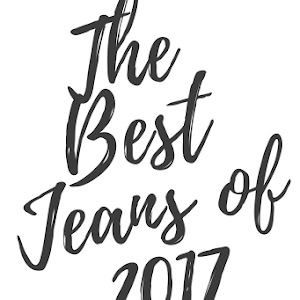 If you're anything like me then you're wearing something denim almost every day, the problem is finding good denim for a decent price. Tailored has some amazing denim pieces for a great price, so if you're in the market head on over! For this look I decided to take this super cute button down blouse and leave the last button undone and tied it to have a more cropped look. As I said before, I am a tall girl and I have a long torso. If you're shorter than me and worried about your stomach showing with styling the top like this don't worry too much! It probably won't show nearly as much skin on a shorter gal than it does on me! This outfit is a super cute way to stand out in trendy pieces! I loved having the oppurtunity to work with Tailored and loved getting to shoot these looks! If you're in the area make sure to stop on by Tailored because there are always exciting things happening in there! Even if you're not local to the area you can always shop through instagram and online!